Comments: The Confederate Reunion Dinner Committee, consisting of 40 ladies led by Mrs. W. D. Patteson and Chairman Samuel R. Gault, served a bountiful feast to 128 veterans and a hungry crowd of over 2000 spectators who attended the event. More than 300 food baskets were donated for the dinner, some of which can be seen on the food-laden tables in this photo. According to the Charlottesville Daily Progress, dated July 22, 1908: "A more abundant and delicious feast has never been seen anywhere. The "Old Vets" were waited on first, then the entire crowd was given just as much as they could eat of everything good. Too much credit can not be given to Chairman Gault and his Committee of ladies for the admirable manner in which the dinner was conducted." 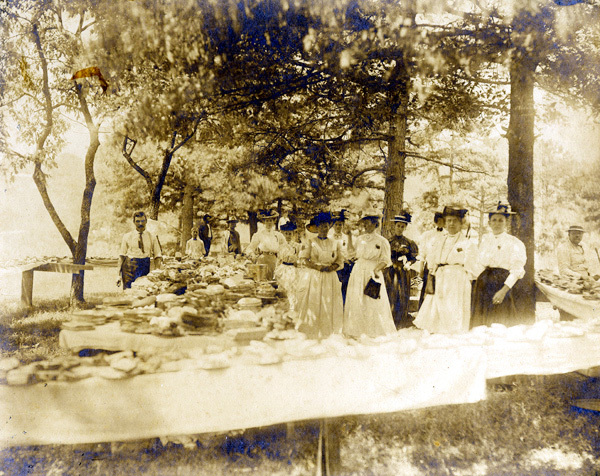 In this photo, Chairman Gault can be seen at the far right, wearing a straw hat and copping a sandwich from the ladies' dinner table. Scottsville Mayor Jackson Beal introduced the after-dinner speakers, which included Congressman John Lamb of Richmond, Micajah Woods, D. H. Pitts, and Senator Thomas S. Martin, who gave a moving tribute to Scottsville's Major James C. Hill. Mary Lewis Patteson, President of Scottsville's United Daughters of the Confederacy chapter, also highlighted the dinner in her UDC minutes as: "The program consisted of band music from Charlottesville, flights of oratory, and pathetic war reminiscences."